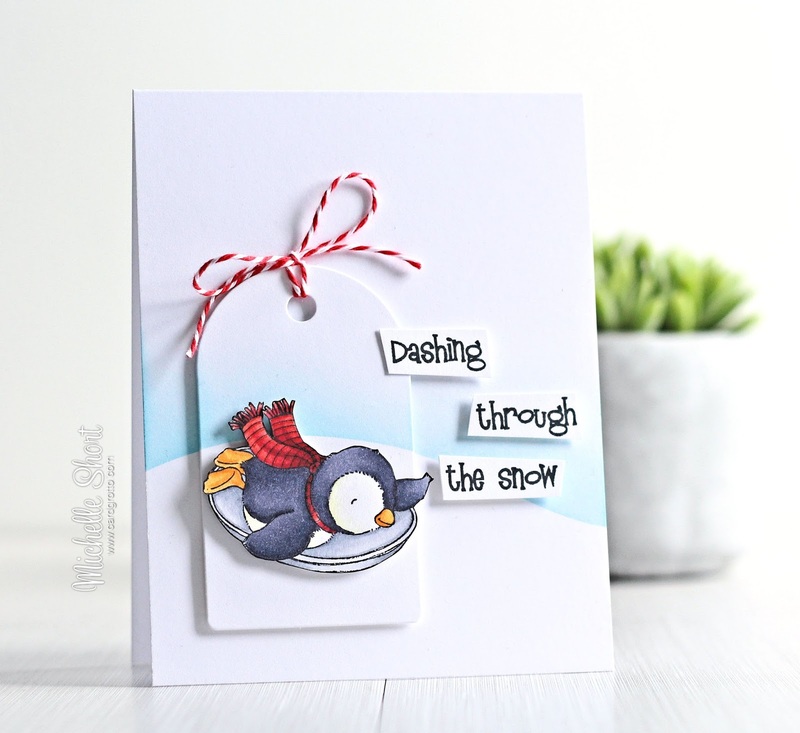 Hello there, today I have another card to share using the new Snow Day release from Purple Onion Designs. Today I am using Dash the penguin. Isn't he cute? I started off by stamping Dash on to a piece of cardstock with black ink and then coloured hi with Copics (colours used are listed under the supplies section). He was then fussy cut out using scissors. I took an MFT Snow Drifts die and cut this from mask paper. This was added to the bottom of a white A2 card base. I softly applied Tumbled Glass Distress Ink on to the top of it, to look like a snow bank with a place blue background. I took the mask and added it to a white CB tag too (sadly now discontinued) and did the same thing, so that it matched up with the card base. I tied Ladybug Doodlebug Twine around the top of the tag and placed it on to the card base with foam tape. Dash was then added on top with foam tape also. The sentiment was stamped on to white cardstock and cut out with scissors. It was added to the card base with more foam tape. To finish, I added red Spica pen to Dash's scarf. COPIC MARKERS - Dash: BV29, BV25, BV23, Y11, Y0000, YR16, YR15, YR21, Y13. Scarf: R89, R37, R29, R27, R14. Sled: C5, C3, C2, C1, C00. When I made the card, I didn't actually realise the penguin was called Dash! 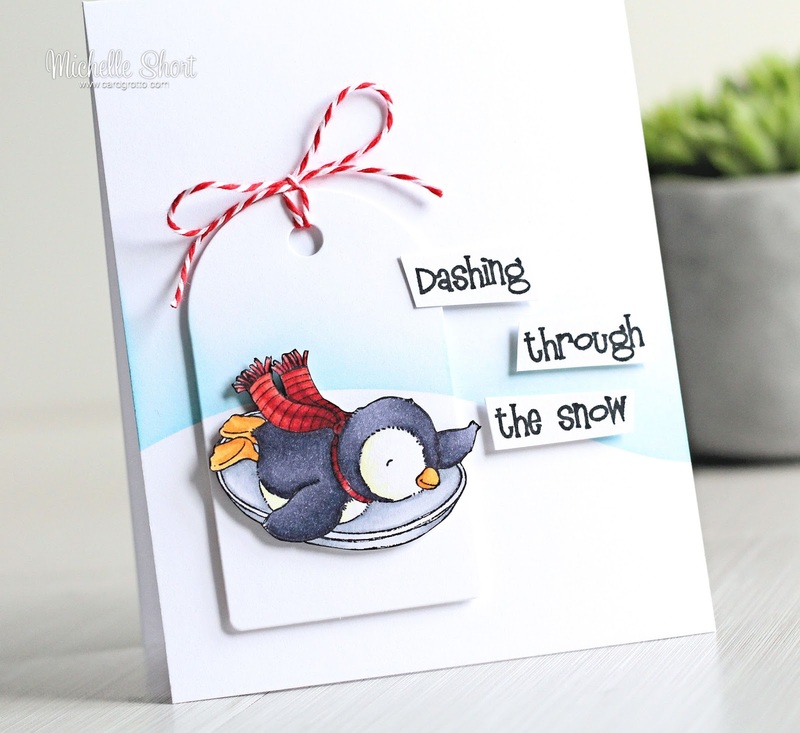 It's great how these little things turn out sometimes :) You can see more inspiration using the new Snow Day collection over on the Purple Onion Designs Blog. Thank you so much for visiting me today. I hope you have a great day! Michelle, this is so sweet! Love the clean design focusing on Dash. love love love - penguins snow CAS whats not to love - btw what are copic spica pens ? He's very cute, and I love the inking on the card.